Our Detect Cancer Early Programme aims to improve cancer survival rates in Scotland to amongst the best in Europe by diagnosing and treating cancer at the earliest stages. Social marketing has a big part to play, and our most recent campaign – ‘Join the Bowel Movement’ – focuses on the growing number of people in Scotland returning their bowel screening test, in a bid to motivate others to do the same. Bowel cancer is the third most common cancer in Scotland with around 4,000 people diagnosed each year. The bowel screening test is sent out to everyone in Scotland aged 50-74 every two years through the Scottish Bowel Screening Programme and remains the most effective way of finding the disease early, when the likelihood of survival is 14 times higher. Every year, over half a million people in Scotland complete and return their bowel screening kits. And although the figure is higher than ever before, we created ‘Join the Bowel Movement’ to specifically talk to those people who put off taking the test. By highlighting the growing number of people in Scotland who are routinely returning their test, the campaign aims to encourage others of screening age to do the same. The campaign call to action gives a clear benefit of doing the test – ‘do yours, it could be a life-saver’. And the campaign is really making a difference with an additional 9,700 tests returned during its most recent phase. Even more encouraging is the fact that one of the largest increases in bowel screening uptake has been from men in the most deprived areas of Scotland. This group has a higher risk of bowel cancer yet are less likely to take part in screening. They’re now returning an additional 5,000 bowel screening tests a year (comparing 2016 to 2011). With almost 580,000 tests being completed and returned in 2016 – the bowel movement campaign has drawn support from Scottish celebrities including Fred MacAulay, Still Games’s Gavin Mitchell and Claire Grogan. Commenting on why he felt compelled to get involved Fred MacAulay, said: "There have been incidences of bowel cancer amongst my friends and family, and because of screening, they’ve survived. I do my test every two years and personally think the screening we’re offered in this country is a great thing. I’d encourage everyone who is invited to take the test and hopefully this campaign will help make that happen." 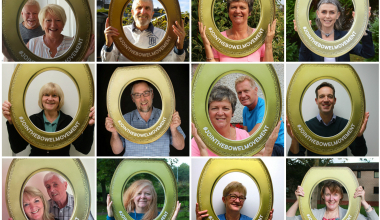 A swell of people from across Scotland have got behind the drive by sharing their motivations for doing the bowel screening test, and encouraging people like them to do the same. And with figures showing that, on average, 47,500 tests are returned in April in Scotland, the ‘movement’ momentum is being maintained throughout Bowel Cancer Awareness Month. We’ve teamed up with Bowel Cancer UK to encourage more Scots to do the test, or request a replacement test if they’ve mislaid it.